Danny Graham scored twice to make it four goals for the season as Watford progressed into the Carling Cup second round after easing past Aldershot. 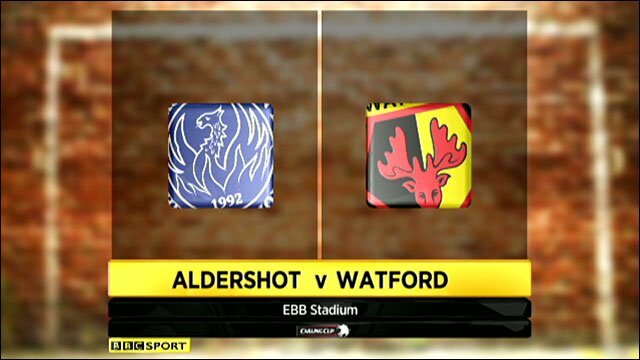 After some early Aldershot pressure, Watford took control of affairs. Graham's first came when he was played through on the edge of the box by Marvin Sordell and calmly slotted the ball low beyond goalkeeper Jamie Young. Sordell converted Lloyd Doyley's cross for the second before Graham beat the offside trap to seal the victory. "The performance was good. The quality of their forwards was exceptional tonight, and that was shown in the game against Norwich. "I'm pleased with the way the team played, disappointed with the goals, but we had a few chances at the end and didn't score, but I think we'll score a lot of goals with that system. "We moved the ball very well and they had to work hard to close us down. But I want the boys to pass it, I want them to get in midfield. We got in some good areas tonight." "You come to some of the cup draws and if you don't apply the right mentality to a team in a different league from you, an upset is so easily on the cards. "We came down to Aldershot, who did well last season, and I knew it would be difficult if we didn't apply ourselves like we do in the Championship." 93:29 The referee gets the match started. 90:00+2:52 Wade Small gives away a free kick for an unfair challenge on Stephen McGinn. Adrian Mariappa restarts play with the free kick. 90:00+2:29 Attacking throw-in by Danny Hylton (Aldershot). 90:00+1:48 Corner taken left-footed by Ben Harding, Rene Gilmartin makes a save. 90:00+1:11 Defending throw-in by Ben Herd (Aldershot). 90:00+0:11 Marvin Sordell fouled by Clayton Fortune, the ref awards a free kick. Don Cowie restarts play with the free kick. 89:27 Defending throw-in by Lloyd Doyley (Watford). 89:20 Attacking throw-in by Jermaine McGlashan (Aldershot). 88:32 Goal kick taken long by Martin Taylor (Watford). 88:16 Damian Spencer has shot on goal from just outside the box which goes wide of the right-hand upright. 87:21 Attacking throw-in by Lloyd Doyley (Watford). 85:27 Defending throw-in by Jamie Vincent (Aldershot). 84:20 Attacking throw-in by Lee Hodson (Watford). 82:14 The official flags Marvin Sordell offside. Jamie Young restarts play with the free kick. 81:09 Danny Hylton concedes a free kick for a foul on Lee Hodson. Rene Gilmartin restarts play with the free kick. 79:57 Goal kick taken long by Jamie Young (Aldershot). 78:55 Michael Bryan fouled by Jamie Vincent, the ref awards a free kick. Direct free kick taken by Michael Bryan. 76:37 Substitution Watford substitution: Will Buckley replaced by Michael Bryan (tactical). 76:37 Substitution Michael Bryan replaces Will Buckley. 76:37 Substitution (Aldershot) makes a substitution, with Jermaine McGlashan coming on for Emmanuel Panther. 73:23 Attacking throw-in by Lloyd Doyley (Watford). 73:06 Goal kick taken long by Rene Gilmartin (Watford). 72:44 Anthony Straker produces a left-footed shot from just outside the box that misses to the right of the goal. 72:06 Goal kick taken long by Jamie Young (Aldershot). 69:55 Goal kick taken long by Rene Gilmartin (Watford). 69:21 Defending throw-in by Jamie Vincent (Aldershot). 68:50 Goal kick taken long by Jamie Young (Aldershot). 66:22 Substitution Watford substitution: Danny Graham replaced by Troy Deeney (tactical). 66:22 Substitution (Watford) makes a substitution, with Troy Deeney coming on for Danny Graham. 66:22 Substitution Damian Spencer replaces Marvin Morgan. 66:22 Substitution Luke Guttridge goes off and Wade Small comes on. 64:16 Anthony Charles fouled by Marvin Sordell, the ref awards a free kick. Free kick taken by Jamie Young. 63:38 Attacking throw-in by Lee Hodson (Watford). 63:21 Defending throw-in by Lee Hodson (Watford). 62:20 Lee Hodson takes the free kick. 62:20 Substitution Ross Jenkins joins the action as a substitute, replacing John Eustace. 62:20 The assistant referee signals for offside against Marvin Morgan. 61:31 Defending throw-in by Jamie Vincent (Aldershot). 60:55 Goal kick taken long by Jamie Young (Aldershot). 60:27 Don Cowie takes a outswinging corner. 59:32 Goal kick taken long by Jamie Young (Aldershot). 58:42 Unfair challenge on Marvin Sordell by Ben Herd results in a free kick. Free kick crossed right-footed by Don Cowie from left wing. 57:54 Defending throw-in by Jamie Vincent (Aldershot). 57:01 Unfair challenge on Danny Graham by Jamie Vincent results in a free kick. Will Buckley restarts play with the free kick. 56:29 Foul by Danny Hylton on Lloyd Doyley, free kick awarded. Direct free kick taken by Martin Taylor. 54:51 Defending throw-in by Ben Herd (Aldershot). 54:17 Defending throw-in by Lloyd Doyley (Watford). 53:39 Attacking throw-in by Jamie Vincent (Aldershot). 51:26 Clayton Fortune challenges Stephen McGinn unfairly and gives away a free kick. Free kick taken by John Eustace. 49:55 Goal kick taken long by Jamie Young (Aldershot). 49:12 Shot from just outside the area by Stephen McGinn goes over the bar. 48:54 Attacking throw-in by Lloyd Doyley (Watford). 47:02 GOAL - Danny Graham:Aldershot 0 - 3 Watford Danny Graham grabs a goal from just outside the area to the top left corner of the goal. Aldershot 0-3 Watford. 46:41 Attacking throw-in by Jamie Vincent (Aldershot). 46:17 Goal kick taken long by Jamie Young (Aldershot). 45:20 Free kick awarded for an unfair challenge on Luke Guttridge by Lloyd Doyley. Ben Herd restarts play with the free kick. 45:00+0:49 Defending throw-in by Jamie Vincent (Aldershot). 44:03 Lloyd Doyley provided the assist for the goal. 44:03 GOAL - Marvin Sordell:Aldershot 0 - 2 Watford Marvin Sordell finds the back of the net with a goal from deep inside the penalty box to the top right corner of the goal. Aldershot 0-2 Watford. 42:53 Free kick awarded for a foul by Marvin Morgan on Lee Hodson. Rene Gilmartin takes the free kick. 41:08 Defending throw-in by Ben Herd (Aldershot). 40:36 The official flags Marvin Morgan offside. Direct free kick taken by Adrian Mariappa. 39:27 Danny Graham gives away a free kick for an unfair challenge on Jamie Vincent. Direct free kick taken by Jamie Vincent. 38:02 Goal kick taken long by Rene Gilmartin (Watford). 37:36 Header from deep inside the area by Ben Herd goes harmlessly over the crossbar. 36:25 Goal kick taken long by Jamie Young (Aldershot). 35:51 Goal kick taken long by Jamie Young (Aldershot). 35:34 Shot from deep inside the area by Marvin Sordell goes over the bar. 33:54 Defending throw-in by Jamie Vincent (Aldershot). 33:11 The referee blows for offside. Jamie Young takes the direct free kick. 31:34 Defending throw-in by Ben Herd (Aldershot). 30:48 Outswinging corner taken right-footed by Don Cowie played to the near post. 30:24 Free kick awarded for an unfair challenge on Will Buckley by Emmanuel Panther. Direct free kick taken by Lee Hodson. 28:50 Defending throw-in by Lloyd Doyley (Watford). 24:34 Attacking throw-in by Jamie Vincent (Aldershot). 24:09 Attacking throw-in by Jamie Vincent (Aldershot). 23:36 Luke Guttridge takes a shot. Save by Rene Gilmartin. 21:32 Shot from 20 yards from Marvin Morgan. Save made by Rene Gilmartin. 20:30 Defending throw-in by Ben Herd (Aldershot). 18:55 Inswinging corner taken right-footed by Don Cowie played to the near post, clearance made by Marvin Morgan. 16:34 Attacking throw-in by Jamie Vincent (Aldershot). 16:11 Free kick awarded for a foul by Danny Graham on Anthony Charles. Jamie Young restarts play with the free kick. 15:53 Defending throw-in by Jamie Vincent (Aldershot). 15:13 Attacking throw-in by Lloyd Doyley (Watford). 14:56 Defending throw-in by Lloyd Doyley (Watford). 13:57 GOAL - Danny Graham:Aldershot 0 - 1 Watford Danny Graham fires in a goal from the edge of the area to the bottom right corner of the goal. Aldershot 0-1 Watford. 12:59 Goal kick taken long by Rene Gilmartin (Watford). 12:25 Attacking throw-in by Jamie Vincent (Aldershot). 11:59 The referee blows for offside. Free kick taken by Jamie Young. 11:28 Attacking throw-in by Jamie Vincent (Aldershot). 11:09 John Eustace challenges Luke Guttridge unfairly and gives away a free kick. Direct free kick taken by Jamie Young. 10:44 Foul by Marvin Morgan on Adrian Mariappa, free kick awarded. Rene Gilmartin takes the direct free kick. 10:06 Defending throw-in by Jamie Vincent (Aldershot). 8:15 The referee blows for offside. Lee Hodson restarts play with the free kick. 7:12 Inswinging corner taken from the left by-line by Don Cowie. 6:42 Attacking throw-in by Lloyd Doyley (Watford). 6:32 Defending throw-in by Lloyd Doyley (Watford). 5:10 Outswinging corner taken right-footed by Don Cowie, Emmanuel Panther manages to make a clearance. 4:39 Defending throw-in by Lloyd Doyley (Watford). 4:07 Anthony Straker takes a shot. Save by Rene Gilmartin. 3:53 Attacking throw-in by Ben Herd (Aldershot). 3:23 The assistant referee flags for offside against Marvin Sordell. Free kick taken by Jamie Young. 2:54 Goal kick taken long by Rene Gilmartin (Watford). 2:12 Attacking throw-in by Lloyd Doyley (Watford). 1:49 Defending throw-in by Lloyd Doyley (Watford). 1:15 Attacking throw-in by Ben Herd (Aldershot).